Good afternoon all. Today is the day that candy starved cherry Tomato Snobs dress in crazy costumes and go wild for scary tricks and sweet treats. Happy Halloween! This past weekend my husband an I got together with our good friends Haley and Pablo to have our first ever pumpkin carving party. It was such a blast! I wish I had the photos to show you how well we all did on our pumpkins. I'd bug Haley to send them but she's getting married Saturday and I know how stressful wedding week can be, so I'll just wait to post those pics at a later date. Today I'll leave you with a real freaky photo. A few weeks back I was asked to pull the meat off two suckling pigs. Not really the most glamorous way to start my day but perfect for a freaky Halloween post. I'm a huge fan of pulled pork sandwiches, however after this experience I'm not sure i'll ever be able to look at pulled pork the same way again. I wish everyone a safe and fun Halloween tonight! Remember to check your candy and make sure nothing looks like it's been tampered with. Happy Friday fellow Tomato Snobs. I wanted to share something cute with you before saying goodbye for the weekend. Last week I was working alongside another chef who was making an appetizer with blue cheese, fresh figs and prosciutto. She asked if I was a fan of blue cheese and I replied with "I do not love moldy cheese" a few minutes later she came over to my work space and announced "you may not love blue cheese, but It sure loves you". I smiled politely since I had no idea what she was talking about, until I looked down and saw a little crumble of blue cheese in her hand. 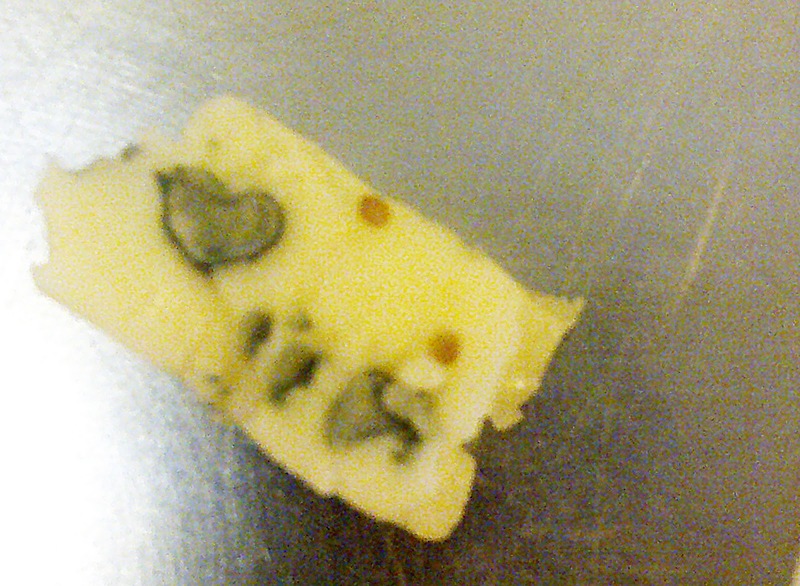 Within the crumble of stinky molded cheese appeared a little blue heart. How adorable! If yesterday you were thinking; Damn! I wish Jaime would have posted the recipe for that chicken chili she served the corn bread with, well your prayers have been answered. This was one of those thrown together, whatever's left in the fridge chili's and It honestly couldn't have turned out more delicious. 1/2 can white kidney beans - thats all I had left, but use a whole can if you have it. 4 cups chicken or veg stock. PREP: chop all veg. Grind spices in grinder or using a mortar and pestle - or buy pre ground. COOK: Sautee onions in butter and olive oil until they start to turn translucent then add in garlic. After 1 minute or so add in the chicken and spices. With a wooden spoon start to break up the chicken into smaller pieces, add flour and continue cooking until liquid is no longer visible. Add the chicken stock, chopped veg and then simmer for 1 hour or so. Before you serve add chopped cilantro or parsley. 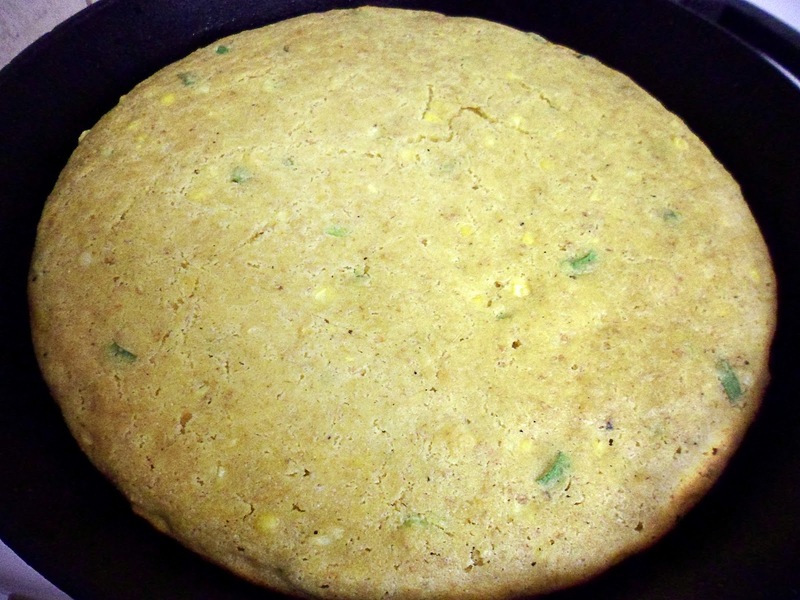 SERVE: with shredded cheese and finely slices green onion, or along side my skillet corn bread. The best thing about making skillet corn bread is making skillet corn bread! It's one of the simplest breads to make and you can easily exchange one ingredient for another, with endless delicious possibilities. For example change the green onion for cilantro, or parsley or add jalapeno or grated cheese... endless I tell you! The one thing thats a must in this recipe is your cast iron skillet. PREP: Pre heat oven to 450 with your cast iron skillet inside. Mix all dry ingredients add the corn kernels and onion to the dry, and wisk all the wet ingredients (reserve a small amount of the butter for the skillet). Then slowly fold the wet ingredients into the dry until combined. COOK: Remove skillet from over, and drizzle small amount of butter. Drop temp to 375. Add the cornbread mixture to the buttered skillet and bake for about 20 mins - test with a toothpick to make sure it comes out dry. Let cool for 10 mins before serving. * to make it extra buttery and luxurious you can brush some melted butter on top at the end. 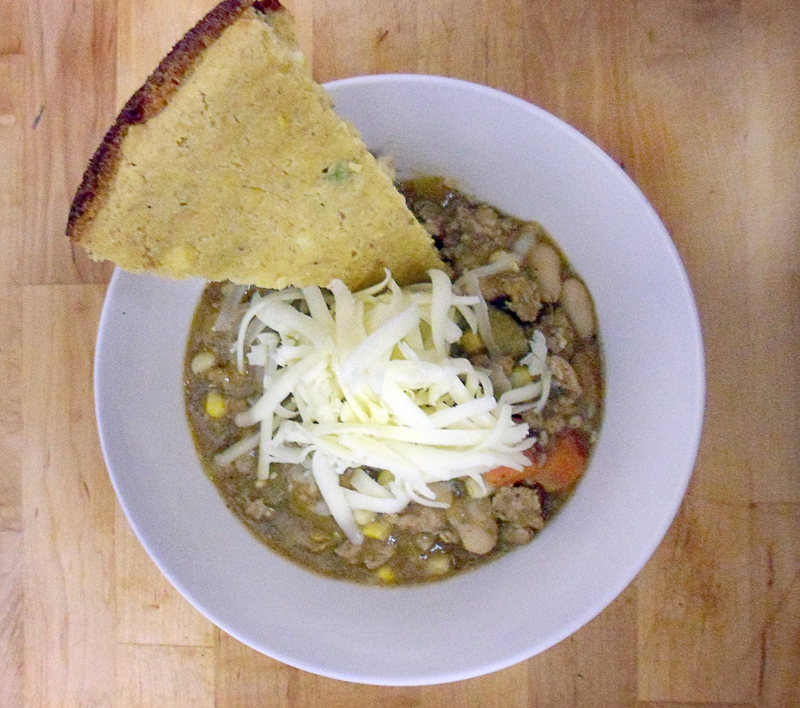 * seen here with my white bean chicken chili - recipe will follow. Hi guys, sorry no post yesterday. I've been slammed with work for the past few days. It's been event after event. My body feel like a broken hot mess and today we are catering a 400 person event for Hilary Weston. For those of you who don't know who Hilary is she's a big f-ing deal in Toronto. So tension in the kitchen has been pretty high... well actually not too bad considering. Our Executive chef Paul has nerves of steal and nothing seems to phase the guy but there has been an enormous amount of cooking to do. Anyways, since I have no time for a proper post I leave you or rather refer you to a wonderful blog that satisfies the senses called Spoon Fork Bacon. Enjoy! 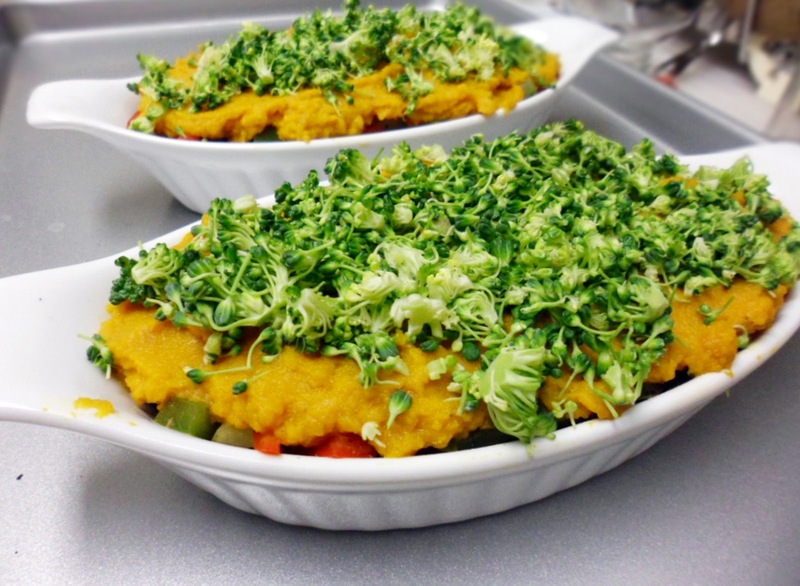 Farmers Pie - Like Shepherds pie with more vitamins! 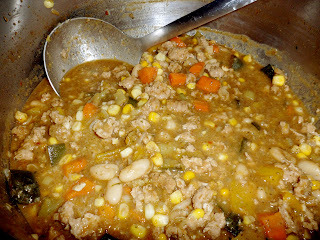 Following in the theme of the National Post article I thought todays recipe would be a perfect follow up to creative comfort food. Cold weather always makes me feel like comfort food and Shepherds pie definitely one of those dishes. Shepherds or Cottage pie is a delicious stick to your ribs classic. It's usually made up of minced beef or lamb buttery mashed potatoes and can sometimes include chopped carrots, green peas or sweet corn. I've created my own version using a carrot puree and tons of veggies topped with broccoli confetti. PREP: chop all veggies. Pre heat oven to 350. For carrot puree: in a small pot simmer carrots in about 1/2 cup of liquid until the carrots are soft. You can use beef/ chicken or vegetable stock - water is fine as well. 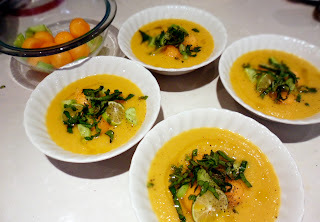 When carrots are soft puree with 1tsp of dijon mustard until smooth with immersion blender, or cuisinart. Add more liquid if mixture is to thick. A tsp of butter can also be added if you're not counting calories. * sweet potatocan be substituted for carrots if you prefer. For meat mixture: In a large pan heat olive oil and sautee onions until translucent, add garlic peppers and corn a pinch of s&p. Cook for about 5 mins until tender. Remove from heat, and place in a separate bowl. Heat the pan until medium high and add ground lamb. With a wooden spoon or heat resistant spatula begin chopping the meat so that it doesn't clump together when cooking. Add a pinch of s&p, then thyme and pinch of cinnamon (if using fresh mint ad at the very end of cooking, if using dry add now). continue to cook until all the pink is out of the meat. Remove (pour out) excess fat from the pan before adding cooked veggies to the mixture. To assemble: In a baking tray or individual ramekins place meat mixture on the bottom, then a layer of carrot puree and broccoli confetti on top. Bake for 20 mins until golden on top. If you'd like to download a pdf copy of the special please click here. It's also been a super busy week at work. Yesterday we catered a 500 person party for the reveal of the new Audi. I'm going to try and get some photos of my beautiful cheese tray from last nights party. It was a beauty. I haven't really said much about it but I started working at an awesome catering company called Catering With Style. It's a small company with a great hard working team, and I also get to work with a friend of mine which makes it a really fun environment. This Sunday i'll be acting as the Executive chef at my first event alone for them. Now all I have to do is shake my cold - not time for sneezing, and no sneezing on the food! Good morning fellow Tomato Snobs. I just wanted to let you in on a bit of news. 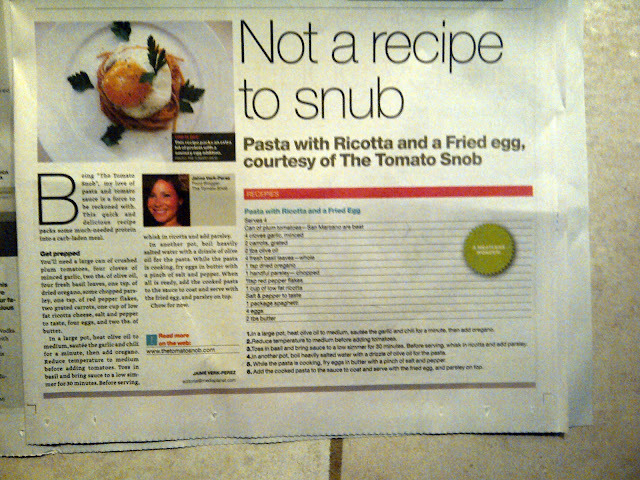 On Thursday, yes this Thursday October 20th, will mark the day of my first published recipe! Horay. I'm so excited! I didn't want to say anything until I knew for sure, but I received confirmation yesterday. Please keep your eyes peeled if you live in Toronto my recipe for Pasta With Ricotta and a Fried Egg will grace the pages of The National Post. I hope this is the beginning of many of my recipes to be published somewhere other then my blog. I want to send out a big THANK YOU to all of my readers for inspiring me and pushing me to continue to follow my dreams! You are all awesome. A special thanks to Jesse for being my personal PR agent - you're the best! There are classic flavor pairings and classic canapés. This chic party pleaser satisfies both of these ideas. 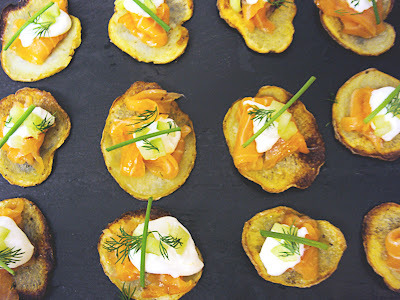 Canapés usually refer to hors d'œuvres - delicious and decorative morsels otherwise know as finger food. 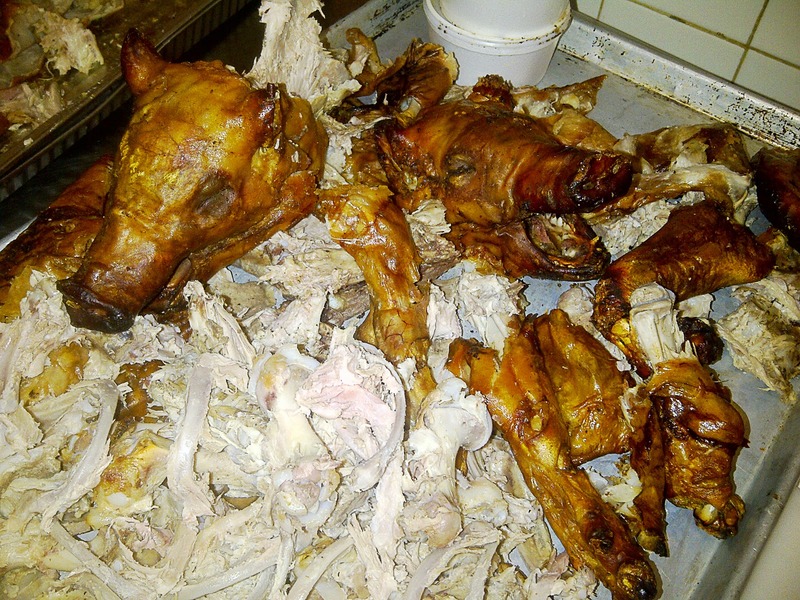 Traditionally a canapé will be served on a dry pathetic round of stale bread, but not these puppies! My classic combination of smoked salmon, potato and creme fraiche is refreshing and light - a far cry from brittle bread and fish scraps. The key is to find great quality smoked salmon, and you can usually do so at your local fish monger. If you're in Toronto City Fish has excellent smoked salmon. You get to decide exactly how much you'd like to buy and they'll even vaccuum seal it for ya. Slice up your potatoes toss in olive oil, s&p then place on baking sheet lined with parchment paper. Pre heat oven at 300. Serve the chip warm or at room temp - but the rest of the ingredients chilled. Choriatiki or Horiatiki means village or country in Greek.When followed by the word salad it refers to a bowl of veggies consisting of chopped tomatoes, cucumber, red onions, feta cheese, and kalamata olives with lots of greek olive oil and oregano. In short it's a chopped salad! In some regions capers are also added to the salad, or vinegar. This delicious mix is mostly eaten in the summer months when all of the ingredients are at their best. 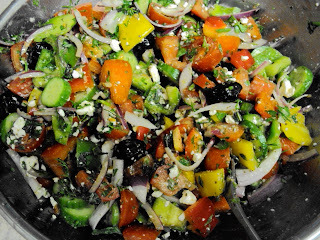 My version of this classic Greek salad uses the addition of fresh herbs and peppers. PREP: Combine everything in a bowl toss and enjoy. This salad is good for 2-3 days. out. The bread was fresh and chewy, but the gloopy cheesewiz and petrified beef left me feeling queasy and empty inside. Here's where the Snob in me really comes out. I give the sandwich a 4.5 out of 10 and I have to say it was totally overpriced at nine bucks. The only redeeming part of my meal was the delicious Birch Beer which tasted suspiciously like Dr. Pepper one of my all time indulgences. 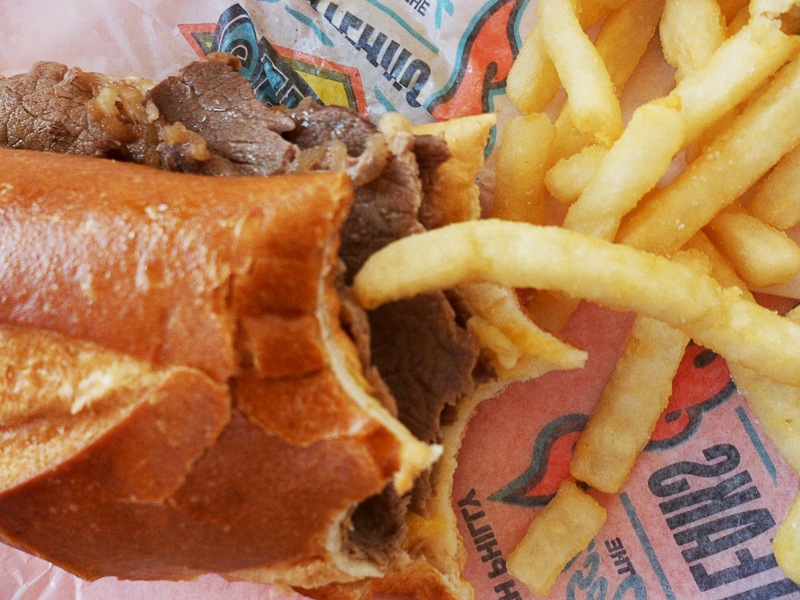 In short there are much better sandwich spots in Philly and you won't have to wait in a line for your meal. We found one of the absolute best chicken Parmesan sandwiches at a quirky little place called Criniti restaurant. Yes the photo looks like a hot mess but please trust me when I tell you it was amazing. At $6.75 the sandwich is a steal! This colossal sammy is ooey gooey mozzarella dripping of the sides of the perfectly crispy Italian roll. The golden fried to perfection, plump juicy chicken breast was wonderful and the tomato sauce was zesty and drenched through the bread as it should be. One bite of this sandwich erased any ill feelings I had towards Geno's. All was right again in the world. Judging by the lack of activity yesterday I see many of my readers are either A. are not a fan of cold cantaloup soup, or B. were too busy enjoying the stunning weather to read my post. Either way It's all good. Today I leave you with an article from The Dish (Torontolife.com) on some buzzing rumors around the restaurant scene. Supposedly 777 Dundas Street West will be the home of a new restaurant by famed chef Susur Lee. The thing thats most interesting is that the face of this alleged resto will be Lee's two sons Levi, and Kai. Momma bear Brenda Bent confirms that the plans are in motion and says the boys hope to open before christmas. One thing is for certain if this unnamed restaurant does make it to opening it will be in good company as the Dundas west strip has been heating up over the last year. I guess we will have to wait and see. This old wives tale was sent to me last week, and I couldn't wait to hare it all with you just in time for cold and flew season. In 1919, when the flu killed 40 million people, there was this Doctor that visited the many farmers to see if he could help them combat the flu. Many of the farmers and their family had contracted it, and many died. The doctor came upon this one farmer, and to his surprise, everyone was very healthy. When the doctor asked what the farmer was doing that was different, the wife replied that she had placed an unpeeled onion in a dish in the rooms of the home, (probably only two rooms back then). The doctor couldn't believe it and asked if he could have one of the onions and place it under the microscope. She gave him one and when he did this, he did find the flu virus in the onion. It obviously absorbed the bacteria, therefore, keeping the family healthy. - I heard this story from my hairdresser in AZ. She said that several years ago many of her employees were coming down with the flu and so were many of her customers. The next year she placed several bowls with onions around in her shop. To her surprise, none of her staff got sick. It must work....Try it and see what happens. We did it last year and we never got the flu. Thanks for the reminder. I don't know about the farmers story.... But, I do know that I contacted pneumonia and needless to say I was very ill... I came across an article that said to cut both ends off an onion put it into an empty jar.....placing the jar next to the sick patient at night. It said the onion would be black in the morning from the germs.... Sure enough it happened just like that.... The onion was a mess, and I began to feel better. Wow - pretty amazing tale. I'm a firm believer in the power of onions and garlic. I double dare all of you to try this old remedy out at some point this winter. Please share your finds. 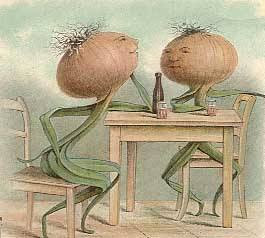 Stay posted for tomorrows follow up in Part Two of Tales of Onions. Sorry to keep you all waiting. The Jewish holidays left no time for blogging. I was super busy with catering a party Saturday night and today was my first day working at Catering with Style where I've been hired on for a few large parties. Needless to say I have been a busy bee and I'm totally pooped. Since it is Monday and I've left you in the lurch for a few days I'm making a serious effort to write a short post today. I want to tell you all about an amazing little shawarma stand in Thornhill called Bagel Nash. For those of you who don't know what Shawarma is you are seriously missing out. Shewarma is a Middle Eastern delight made by stacking either lamb, chicken or turkey in think slices on a mettle skewer that cooks for hours on rotisserie. The juices from the meat slowly drips down and creates crunchy little bits surrounded by moist juicy meaty goodness. 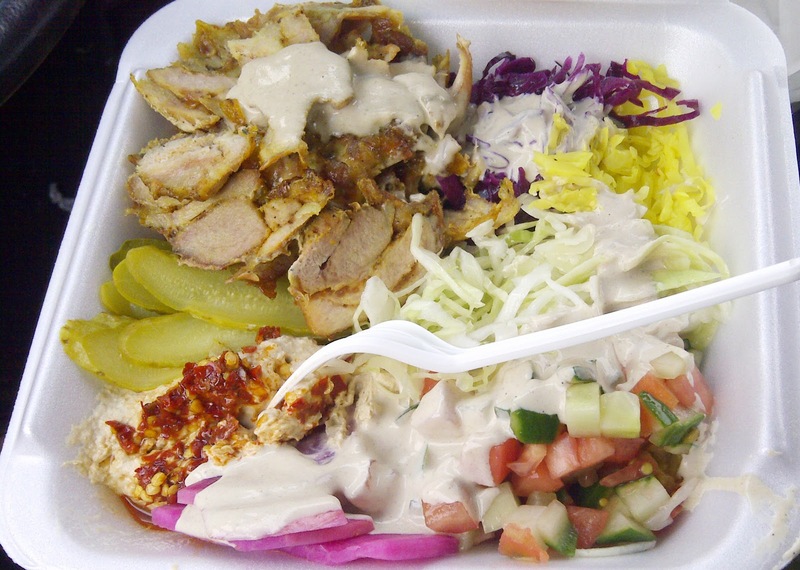 The meat is shaved off the skewer and serves with pickled turnips, cucumbers, Israeli salad, cabbage salads, hummus, tahina and skhug. BN (Bagel Nash) is made up of a bakery counter with beautiful looking pastries and obviously bagels as well as a walk up window where you can order some of the city's best shawarma and falafel. I was running errands a few weeks back and I couldn't resist stopping in for some take out. If you love middle eastern food this place is a must try!